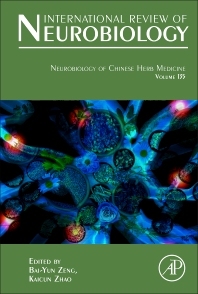 Neurobiology of Chinese Herb Medicine, Volume 135 is a valuable book for anyone interested in alternative medicine or the scientific research surrounding ancient herbal medicine. This updated volume in the series includes chapters that delve into timely topics, including the Effects of Lycium Barbarum on the Visual System, the Effect of Chinese Herbal Medicine on Alzheimer’s Disease, the Effect and Mechanism of Chinese Herbal Medicine on Parkinson’s Disease, the Neurobiology of Chinese Herbal Medicine on Major Depressive Disorder, the Treatment of Insomnia with Traditional Chinese Herbal Medicine, and the Metabolic Factors and Adult Neurogenesis: Impacts of Chinese Herbal Medicine on Brain Repair in Neurological Diseases. This series is ideal for Chinese herbal medicine practitioners who are working in a clinical environment, although the clinical applications of Chinese medicinal herbs presented provide useful references and guidance for any clinical practice that specializes in the treatment of various conditions. Dr. Bai-Yun Zeng is a visiting senior fellow of King’s College London, and a Guest Professor of Sichuan University West China School of Pharmacy, China.